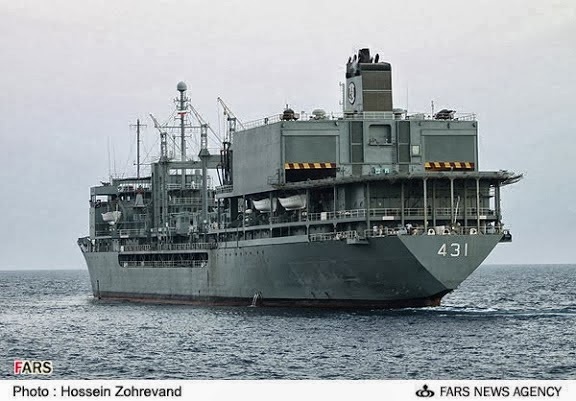 A senior Iranian naval commander said today that the IRIN’s warships had begun their journey to the Atlantic Ocean via waters near South Africa, and close to U.S. maritime borders. Haddad did not elaborate what kind of message the Iranian navy intended to send to the United States, or the timing of the message. Iran and the U.S. are engaged in talks to strike a comprehensive deal over the country’s nuclear program. It's a shame that the U.S. is so advanced a society. If less civilized people were running the country, they would send a taskforce out there, demand that the Iranians abandon the ship and then sink it if it tried anything. Reagan, who was a great person, but far less evolved did this to Iran in 1988 in Operation Praying Mantis but even he was merciful and destroyed only about 3 ships before calling off the attack against the pathetic Iranian navy. Iran's navy is a freakin joke and Rear Admiral Afshin Rezayee Haddad's comment is moronic. Iran has no warships capable of sending any message to the US and the moron is doing nothing other than making a juvenile taunt that he can't back up. It would take the US about 12 hours to sink every ship in the Iranian navy either in the Atlantic or along Iran's coast or in port. this buffoon Haddad must think that the Iranian people are all ignorant and stupid. It's funny to see the fan boys getting their knickers in a twist about a couple of Iranian naval ships approaching America yet, they remain silent about America doing the opposite and more. Yes, so "advanced" and "civilized" with it wars and bases around the world. The world would be better off without that kind of "civilized". Port of call Havana Harbor. hahahaha...kheyli khub umadi ino...hahaha civilized ppl...i think guantanamo is soooo civilized you should go there for a trip....using military to produce opium in afghanistan is very civilized...calling the EU fuckers is the western community of values. And for more just google "US VETOS AT THE UN"
oh i think now of the words my father said: Be careful my son. There are Sharks and Wolfs outside in the world. But be much more careful of the Sharks and Wolfs in sheep's clothing. Dont forget that: To ensure your and mine living standards in the west a lot of ppl have to suffer in Africa and middle east. The different between me and you is: You are just ignorant at this point. You know in a classroom there are a strong guy. Very very strong guy. He always beat the weak ones because they dont wear the same cloths and are just not cool. And in this class are a few guys nobody talk to them because they are not popular. But the strong guy dont beat them because he had tried one or two times but they did not fear him and finally the strong guy gets a bloody nose. So he decide just to concentrate on the weak ones. Stole there breaking snacks and so on as he usually did. One day the weak ones get punch again and that is the break even point. The weak ones and the not so popular guys together comes to the point that we could beat him very easily all together. So they did it VERY VERY successful. Be sure Iran would not dare to send any warship 10 or 15 years ago. But nowdays its time to say we dont care about your strong arms. Unfortunately, another world war is inevitable, like death, but not yet. This follows from the analysis of the biblical prophecies. Let me remind here a fragment of an ancient vision: "And [the king of the north] will go back (to) his land with great wealth [1945. This detail indicated that Hitler will attack also the Soviet Union and will fight to the bitter end. In the beginning there were no signs of such the ending of this war]; and his heart (will be) against the holy covenant [hostility towards Christians]; and will act [it means activity in the international arena]; and turned back to his own land [1991-1993. The collapse of the Soviet Union and the Warsaw Pact. Russian troops returned to their country]. At the appointed time [he] will return back." (Daniel 11:28, 29a, literal translation) The return of Russia in this context means crisis, which will eclipse the Great Depression. Not only the eurozone will break up, but also the European Union and NATO. Then many countries of the former Eastern block will return to Russia's zone of influence. Russian troops will be stationed here again. Moses writes: "But ships from the direction of Kittim [US Navy], and will afflict Asshur [Russia] and will afflict Eber [remaining enemies, including Iran and China]." (Numbers 24:24a). I have much sympathy and respect for Iran whenever it expressedly states that it will defend itself against any sort of aggression. But what they are doing now is a depature of that good old strategy. I'm not sure that this latest move will benefit Iran. What we are seeing here is a kind of "power projection" and quite frankly, ridiculous display of a disillusional offensive capability. What Iran needs the most in these times is to maintain and/or continue to gather sympathy and support from the international community to make it through the agenda that was set into motion by the US and EU. Sending warships to what they percieve as their main "opponent" isn't really of any use for the otherwise struggling nation of Iran and may instead result in counter-productive responses from other countries and a decrease in moral backing and furthermore, a weakening of the longstanding image of Iran as 'the nation' that was constantly being threathened by the big powers and who always had its armed forces in a defensive posture in the face of Western imperialism. Be careful, because that "strong" boy has his "teachers" on this website.....and they may punish other "students" in that classroom. It is indeed interesting that you have started to visit this site and write coments here. You are very welcome by the way. First of all I do agree with your above comment. I would be greatful if you could share your experience with us on this blog. What is a final prediction for the existence of Great and small satans (the zionist entity and its bigger servant) ?? When is their end ?? Thank you for that my friend. As you probably already know, the Shah was true military man having recieved education in the field of military matters (being a former fighter pilot himself) and he came from a family that had traditionally been in the military, unlike Saddam whose relatives were farmers. Pahlawi as the leader of the nation knew what to look for when he went purchasing military hardware. He wanted the very best at any cost. Also one could say that Iran was offered this piece of equipment or it was made available, because of its location, being the first line of defense against a possible military adventure by the Soviet Union. The F-14 was without a doubt the most capable aircraft of all in that it could independently identify, track, lock-on and fire from a distance like no other. We had nothing that could equal or match the Phoenix missile and none of our aircraft had a radar as powerful/advanced as the one in the F-14. In all honesty our Mirage F1s did not fare well against the F-14 overall. We lost quite a number of Mirage F1s in engagements with F-14s especially in the early stages, 1980-83. Having said that, F-14s suffered losses almost solely at the hands of Mirage F1s, with rare exceptions. Actually we aquired the first batch of Mirage F1s in 1978 and then took delivery of more as each year passed. We thought that this was 'the aircraft' that could rival the F-14, but we were mistaken, as the first batch (EQ export version) in reality was, in terms of missile range and radar detection, not quite on par with even the F-4 'E' version. Later on we recieved newer versions of the Mirage F1 that were equipped with jamming pods and the more potent Super550 missile and better radar (called the EQ4, 5 and 6) and this gave us a very good edge because it considerably increased the survivability and consequently became a true challenger to the F-14...simultaneously the stocks of Phoenix were near empty and they were left with AIM7 missile and after a while, they were down to just AIM9s...so one could say that this previously large gap in combat ability lessened between the two aircraft as time went on. This was perfectly illustrated in 1988 when three of our Mirage F1s shot down three F-14s in one engagement, we got fired upon but none of their missiles could touch us! Thank you very much for this information and your honest opinion. It is indeed in line with my own research (as much as you possibly can do with open sources) and I am grateful for your comments. My father was in the Iranian military during the Shah and the history of the Iranian and Iraqi military and the unnecessary war between our nations is one of my favorite subjects. Did any French pilots fly the Mirage F1's (Combat operations) for the Iraqi Air force? Many thanks again and god bless you. The French did lend their pilots to us, they came over and lived in Iraq temporarily. We purchased Mirage F1s and French pilots were included in the deal, mainly because we had not flown the aircraft that much in France and then suddenly there was this announcement that our airforce was going to war against Iran...naturally we wanted them to keep advising us for a longer time. I'm sure our counter-parts in Iran would have wanted the American experts to remain in order to assist them and provide more knowledge, but circumstances would have it otherwise. Their job was to instruct our pilots on how to use the aircraft for any kind of mission. As for your question, yes, they personally were involved in anti-shipping strikes using their Super Etendard as well as some sorties with the Mirage F1s were performed by, not only a number of French Pilots, but even a few men of other nationalities...you could call them mercenaries from Belgium, South Africa. Egypt sent their Mirage-5s piloted by their own, of course. In time our own pilots would fly the aircraft just as skillfully as the experienced French pilots. The Army Air Corps sometimes allowed East German pilots and Soviet pilots to perform tank-hunting missions with the Mi-25s. Having said all of that, it's worth remembering that the over whelming majority of missions were performed by hundreds of our own pilots. Additionally Both the French and the Americans advised us on appropriate tactics especially versus the F-14. One thing that may be of great interest is that the F-14 had one great weakness. The Americans told us about the properties of the AWG-9 radar and that it could not pick up low flying aircrafts or helicopters due to so called "ground clutter". No matter the power of that radar, it was still made for detecting targets that were flying over the flat sea/ocean, originally designed for fleet defense onboard aircraft carriers. The F-14 was in reality somewhat out of its natural habitat in the service of IRIAF. Pieces of information like that one made us better at tackling the "F-14 problem" so to speak. Thank you for the kind words and god bless you too. Have a nice day, my friend! Many thanks for your honest and detailed answer to my question. May we live in peace and harmony with each other and never repeat the mistakes of those years. long, long after your own end and Ewiak's, so worry about something else.